I developed an intense fixation with subscription boxes last year when I first heard of Curios & Conundrums, a quarterly newspaper subscription from The Mysterious Package Company. With its weird articles, obscure artifacts, and layered puzzles designed to challenge even experienced puzzle solvers, I was absolutely obsessed. Shortly after, I subscribed to The Nocturnal Reader’s Box, a monthly box literally stuffed with horror books and horror fandom stuff. Did I stop there? No. I’m telling you that so you understand this–I have a lot of experience with subscription box services. Last month, I received my first Nailscape Box. As a self-proclaimed semi-professional consumer of subscription services, I’m ready to share my assessment of The Nailscape Box with you–the good and the bad. The Packaging. In my opinion, subscription boxes are great because they’re presents you give to yourself. Packaging probably shouldn’t matter, but it really, really does. The Nailscape Box does packaging right. The box is gorgeous–solid black with the logo in crisp white lettering on the front. The interiors are uniquely designed for each box and can be used as photo backgrounds. You receive a new design each time you receive a package. Over time, you could amass a wide range of backdrops to use in your Instagram posts. 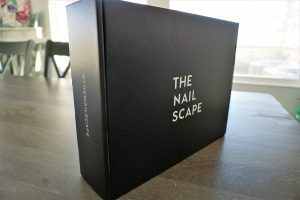 Despite its lower price point, there’s absolutely no denying that the Nailscape Box is a premium subscription. The box is packed full of product. Literally. The sizes are impressive. They aren’t tiny trial containers. These products are the real deal. If you are so inclined to use these items in your services in the salon (as my salons will be), you can do some quick math to determine how much money the box could generate for you (as I have, using the prices from our Venice location). The Artistic Putty kit has enough product to create 50 full sets ($65+) or about 100 fills ($45+). The kit alone will generate anywhere from $3,000-4,500 in sales. The Luxa Polish Shattered Chameleon Flakes contains enough product to perform about a bazillion nails. It’s hard to accurately determine how far those powder pigment containers will go, so my lowball estimate is that it can definitely do 50 nails ($3 each), or 5 sets ($50 each). That disco dust will generate at least $150-250 in New Year’s Eve upgrades. Those products alone will generate $5,850-7,450 in my salon. The Kupa matte topcoat and Cuccio topcoat won’t add any dollar value to our services, but may end up becoming part of our regular backbar if they perform well. It’s nice to have an opportunity to try both without having to order from the companies and pay shipping, which is where the real value of the box comes into play–the opportunity to try a wide variety of products from a range of brands I may not have heard of or would not have considered under normal circumstances. I tend to get stuck in my ways with regards to product choices. I will admit that I had outright dismissed dip systems as a fad, despite the fact that clients have been asking for them. I had also dismissed polygel products because we’ve been happy with our hard gels and acrylics. I normally would not have purchased these products myself until client demand would have justified the investment, but now that we have it and will be using both in our services, these products very likely will become part of our normal menu. The Quality. Some of the boxes I subscribe to have tried to pull fast ones on me. They throw in a few quality items with some not-so quality items–stickers, patches, flimsy paper bookmarks, small keychains, and tote bags that are so thin they’re transparent. 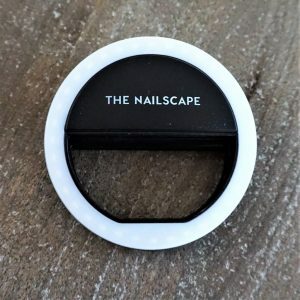 Every item in The Nailscape Box is solid, practical, and usable. Even the postcard that lists the contents is usable! The back has a lovely quote from Winnie Huang about creativity and is designed so it can be slipped into a cute frame and displayed for all to admire. The Variety. Why haven’t I subscribed to any other mani boxes? The few I’ve seen are managed by a single brand. Why would anyone subscribe to a brand’s box when they can buy products from their site? It’s dumb and it goes against the purpose of subscribing in the first place–boxes are fun because of that element of controlled surprise. We sort of know what’s going to be in them, but we don’t know exactly. The Nailscape Box beats competing boxes because it isn’t brand-exclusive. You never know what you’re going to get. Eventually, the goal is for the box to be monthly, but until then, we have to deal with the wait. The Pro-Exclusivity. I’m going to catch hell for this, I’m sure, but while I like the idea of the box containing professional-only products, I’d really like to see some pre-release retail items also. Those of you who have been following me for a while know that I pledge my loyalty to no brand, and while I greatly prefer to utilize pro-exclusive products, I will always use whatever product works best, regardless of the name on the label or where it’s sold. As a salon owner, I want to know about upcoming retail products. The sooner, the better. The Lack of Indies. Indie polishes are insanely hot right now, with makers creating limited batches of gorgeous cremes, holos, and jellies that you can’t find anywhere else. I’m not going to lie, the exclusivity of limited collections makes me feel damn special. I like knowing I have something truly unique that only a few other people have, and so do my clients. A bottle of a Nailscape Box exclusive polish in every box would be amazing. The Pricing. If you’re an experienced (compulsive) subscriber like I am, then you’re probably used to the pricing structures most subscription companies utilize, where you get a small discount if you subscribe for three months, a larger one if you subscribe for six, an even bigger one if you subscribe for nine months, and a huge one if you subscribe for a year. The Nailscape doesn’t offer discounts for long subscription commitments; but it also doesn’t ask for you to commit for longer terms. Long-term subscription discounts are designed to influence your behavior and secure your loyalty. The higher prices on shorter subscription terms are penalties; the “discounts” are a way to evade that penalty. Subscription companies implement these pricing strategies that reward you for subscribing longer because they want as much money as you’re willing to give them, and they want it right away. While this might work out awesome for people like me who have a million subscriptions and aren’t unsubscribing from anything ever (and therefore have no problem committing to and paying for annual subscriptions up-front), these pricing schemes are crappy for people who want to go month-to-month, or grab a box when they feel like it or can afford to. 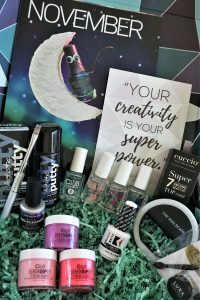 The Nailscape Box renews every other month, and what you see is what you get. $59 + shipping. No pricing gimmicks and no need to commit to or pay for longer terms. If you’re a professional nail technician looking for an affordable premium subscription box that provides a variety of quality products from a diverse range of brands (plus some awesome nail tech swag), then yes, you need to subscribe as soon as you’re able. If you’re a typical hobbyist who likes polishes and beauty items, this box isn’t for you–not just because you have to prove you’re a licensed nail professional but also because it contains products you likely won’t know how to use properly. The Nailscape Box is spectacular, but you don’t have to believe me. Check out the pictures and decide for yourself. 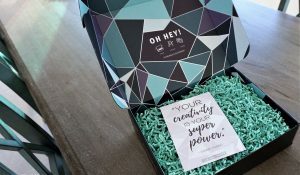 It’s a more polished version of the Owlcrate, with branding and presentation that matches Owlcrate’s organization and consistency, but with more content than the price would suggest. It ranks up with Nocturnal Reader’s Box in that there’s just a ton of stuff, but the quality of every item is more on par with ultra premium boxes like Happy Rebel. You are definitely getting way more than you’re paying for, and the packaging, branding, presentation, and utility of literally everything (including the box itself) puts The Nailscape Box firmly in the premium category. It will never be an Opulent Box (why is that even a thing?!) but it feels a lot like a nail industry equivalent to a Breo Box.